Posted on December 9, 2011 by Brendan Jones Posted in teacherstuff	. The fact that at that particular moment we were moving along in the car got me to thinking. One aspect of GPS tracking I’ve always wanted to achieve was “live” tracking of some type of movement. You know, like in the movies, when the bad guy’s car has a tracker attached to it and the good guy can follow them in real time. I’ve already played around with using GPS dataloggers to track athletes, but the appeal of “live” tracking of athletes with cheap, accessible devices has only just moved from idea to reality. I hope. 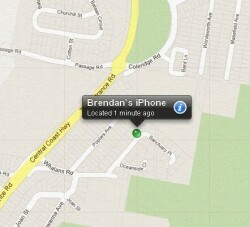 So it occurred to me, what if I could exploit the Find My Phone app to create a live tracker? The iPhone is becoming ubiquitous in schools. Exploiting this fact, and using the Find my Phone app, we could work toward realising the live tracking dream. You need to install the app on your iPhone (and I think it needs iOS5 as well). Then, using iCloud on your PC, you can see where your device is, assuming its switched on. For my live tracking idea to work, I’m hoping that as you move, the location of the phone should reliably move too, creating a basic live feed of the route you are taking. How would you keep this track live and vibrant for posterity? Without trying it, I’m guessing the method of recording the live feed would be a bit clunky, most likely a basic video screen recording of an manually updated iCloud Map, showing the location of the moving device. I won’t know until I give it a go. A couple of questions spring to mind. How could this be useful and, more importantly, meaningful in a PE class? And, has anyone tried it already? Or has someone got another FREE system of live feed GPS happening they’d like to share? I know Instamapper does this, but it doesn’t seem as simple as Find My Phone. Real Time GPS Tracker for Android also looks like a solution for those with Android devices. Tags: GPS. iPhone, iCloud, live	.